I have a love affair with Argentina so it’s appropriate that our meal tonight stems from my first trip there in 2001 (before the crisis). We were outside a small community devastated by the loss of its primary industry (some 40 years earlier). My Argentine colleagues and I were doing some field work on a biological reserve – we had no running water or electricity and it was fantastic. Javier from Salta was our unofficial cook and he worked miracles. 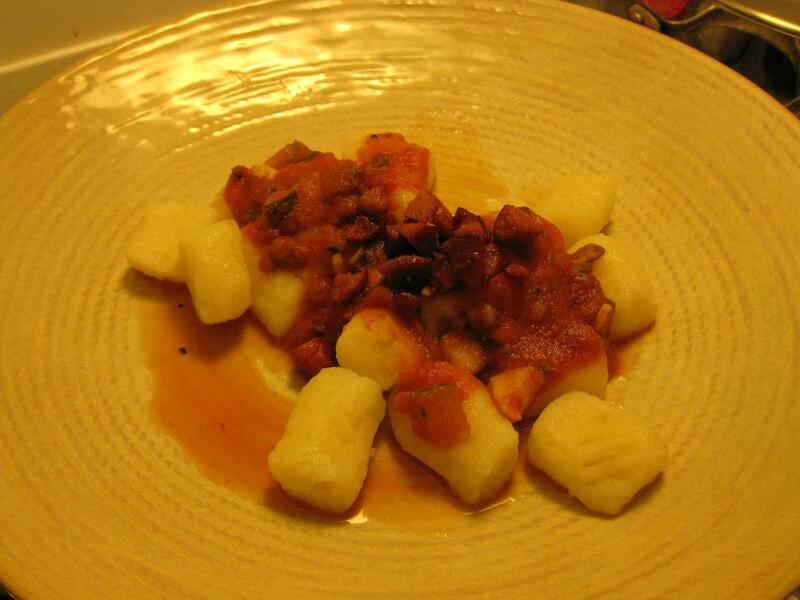 One night he made up Los Ñoquis del 29 – potato gnocchi. I’d never seen or tasted gnocchi before, and for roughing it in the bush, it was divine. The Argentines explained to me that families would make gnocchi towards the end of the month when one paycheck was running out, and the next was a few days away. Noquis before cooking - lots of work to get to this stage! Having no pasta in my hamper (I’ll pick it up at the food bank tomorrow night), I decided to give it a shot. What a lot of work! The sauce was no problem, but I had to boil the potatoes (but make sure they weren’t too soft! ), peel them, mash them, mix them into a dough with flour and salt, roll them into long ropes, cut them into gnocchis and then use a fork to give them some definition (and places for the sauce to stick!) 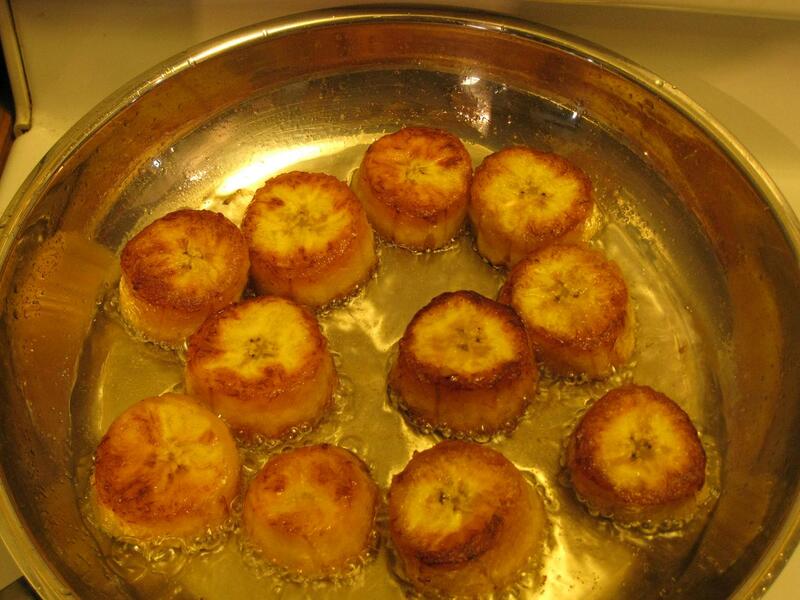 – then boil them and drain them. With sauce - and bits of fried hot dogs - yum. Between caring for our own pets (read, children) and our two foster puppies, I probably didn’t start googling recipes and cooking until 6pm. By 10pm I had eaten but was just finishing the dishes. I’m feeling the “double day” today! I like cooking, but I never spend 4 hours in the kitchen on a week night. But I had dishes to do from yesterday, puppies to care for, gnocchi to tend and lunches to make. I guess I also made some iced tea from an herbal tea I had in the cupboard (I think that’s allowed) and some more Tican Patacones. I just can’t get enough of them. I probably ate half of them as I figured out the gnocchi. Anyway – at first I was beginning to think I was taking a gamble on the gnocchi and maybe should have held out for the pasta and used the potatoes for something I was familiar with. In the end, in two days I’ve eaten well and tried two new and delicious foods. But coming up with the menu is stressful and man, I’m exhausted. At least lunch is ready for tomorrow. 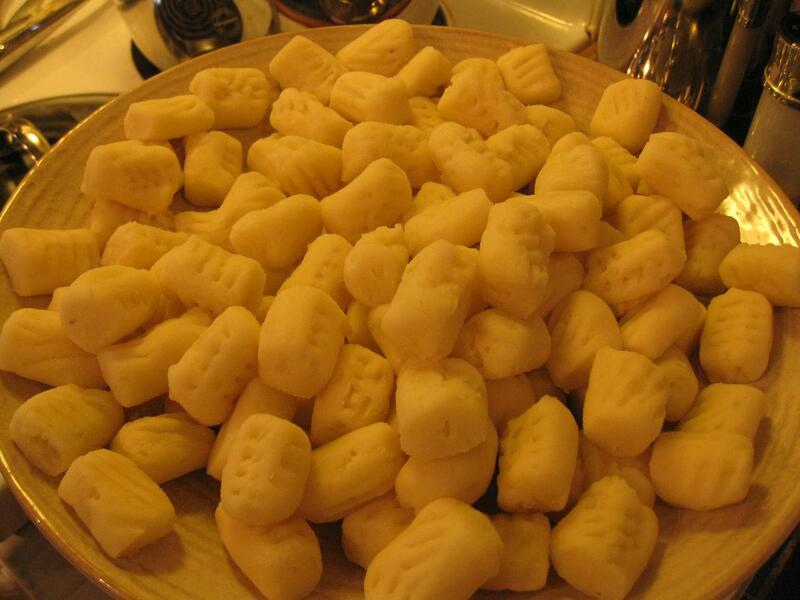 The Gnocchi look like a lot of work but I bet they were delicious. I’ve only ever eaten the ones from a store. I think they are Italian too. I dropped off my canned food at the food bank today. Definitely Italian! Argentine food has a strong Italian influence as there are so many Italian immigrants there!